Discovering American Indian artists who are doing exceptional work is one of my favorite parts of being an American Indian art dealer. My latest discovery is Kewa jeweler Mary L. Tafoya. Although Mary has been working for quite some time, her work is new to me, and I’m absolutely impressed by her. Mary Tafoya grew up at what we used to know as Santo Domingo Pueblo but what we now call Kewa Pueblo. As a child, Mary Tafoya learned to make jewelry by helping her parents, Frank and Anita Coriz, make the “depression era” necklaces that came out of then Santo Domingo during the Great Depression when times were so tough that jewelry materials were difficult to come by. 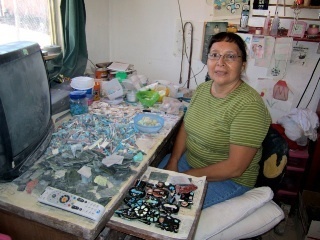 Enterprising artists including Mary Tafoya’s family took found materials like hair combs, old plastic toothbrushes, phonograph records and battery casings, cut them into pieces, and imaginatively glued the pieces together to form mosaic-like patterns on necklaces and earrings. This “depression jewelry” has since become quite popular and highly collectible. In fact, Mary Tafoya’s mother, Anita, who is now in her late 80’s, is soon going to be identifying the makers of these necklaces for the Wheelwright Museum of the American Indian. Today, Mary Tafoya’s jewelry still shows the influence of her earliest work; she still creatively cuts and arranges materials to form a design on her jewelry. This time, though, the materials are natural items like shells, turquoise, coral, and pipestone. Once designed, Mary then uses a mixture of jet to create a foundation that will hold her design in place on a serpentine base. Mary is quick to emphasize that almost every piece she makes is composed on a segment of serpentine, for this is her special trademark. For her necklaces, Mary Tafoya also hand-cuts and hand-shapes her own beads from shells and stones. The resulting jewelry is exceedingly unique, graphic, and exciting. In fact, Mary never repeats any piece to look like any one that she has made before. This handmade, one-of-a-kind quality makes Mary Tafoya’s work highly collectible. On a recent visit with Mary Tafoya at her home, I was struck by just how talented Mary really is. Standing in Mary’s workshop among buckets of large shells, I realized that Mary is really like a graphic designer – she’s hand cutting and shaping these shells and other stones to create geometric shapes like circles and squares that will eventually become bold jewelry designs. I’m so impressed that what she’s doing is entirely her own concept – it isn’t derivative of anyone else. I’m also amazed that she’s able to keep her prices very modest considering that everything is handmade and original. You would think that after 35 years in the business, I would have seen it all, but artists like Mary L. Tafoya still surprise me with their skill and originality. Mary Tafoya shows Marti Struever some of her jewelry that is in the process of being completed.